You can only cram so much information into your brain in one given day. After a day spent on campus from sunrise to sunset, the thought of enduring even one more minute at the library is probably enough to make your stomach turn. We can’t blame you for this hypothetical academic scenario, after all — mental burnout is a very real phenomenon, especially in a collegiate environment. Fortunately, the EnVision Apartments at the University of Akron have some great tips to make your student apartment a place that you can’t wait to come home to. If you’ve followed our previous blogs, you may have encountered this post about decorating tips for your Akron apartment. This is a great place to start if you’re not content with the aesthetics and overall feel of your apartment space, but today’s post looks at a few simple items to have on-hand to make your home away from home feel more like…well, home. From the EnVision Apartments to the University of Akron community, we wish you a great fall 2018 semester and nothing but the greatest academic success. Learn more about why students love the EnVision Apartments across from the University of Akron today! After multiple hours of studying, there’s probably a little bit of smoke rising from your head. Nothing is going to feel more refreshing and satisfying than coming home to a nice, cold drink straight from your refrigerator. Alcoholic beverages are a fine adult choice should you be of age, but otherwise, flavored sparkling waters like La Croix are a great, healthy alternative to conventional sodas. Conversely, when we get further on in the semester and things start getting brisk outside, you’re going to want something soft, fuzzy, and warm to enjoy when you’re home. Wrapping yourself in a soft blanket and throwing on some Netflix after hours of hitting the books is a great way to not only decompress from studying, but stay cozy and warm from the cold weather. Bonus points if you have matching fuzzy slippers! Things are better when they smell better. Essential oils may not solve all possible health problems in humans, but at the very least, most people can agree that essential oils smell pretty great. If coming home to an apartment that smells like vanilla, cinnamon, and chamomile sounds right up your alley, it’s all possible through essential oils. Stimulating and conducive to a focused study environment at home all the way to sleepy bedtime blends, oils are versatile and can suit just about any mood. We Wish You The Best Stay Ever at Our Akron Apartments! 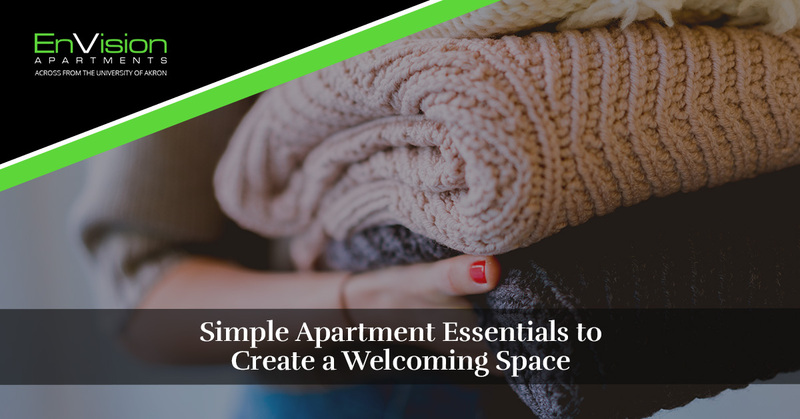 When it comes down to it, it’s up to you to create a comfortable and personalized apartment space that serves as a sanctuary away from the academic chaos on campus. Why settle for anything less? The prime of your life is now and you might as well take advantage of that fact by enhancing your college experience. We’re here to help you enjoy the best college living situation possible. Reach out to the EnVision Apartments today to discover how we can help make your stay as comfortable as possible.